Not long ago, some land-based casinos started to offer their clients an unusual blackjack variation played with just one deck. Its major zest is that blackjack (any Ten and Ace) is paid 6:5 instead of the traditional 3:2. They say that the first place where this blackjack variation was played was Flamingo Hilton Casino located in Las Vegas. Nowadays, it can be found in many other states. What concerns Las Vegas, at every tenth’s table blackjack is paid less than the classical 3:2. What does this novelty mean for the player? At first sight, the difference is unsignificant. This is what most blackjack players in the USA think. 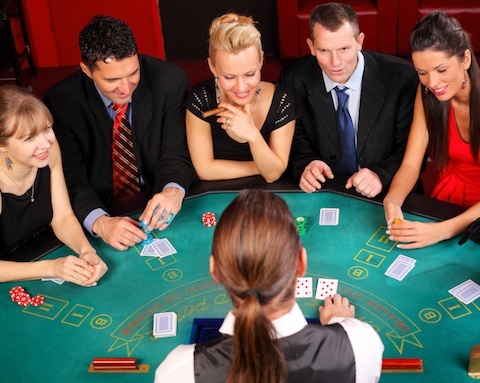 Blackjack played with one deck is a rare thing in today’s land-based casinos. And it’s no secret that this blackjack variation is more beneficial for the player than blackjack played with several decks. This is true than one-deck blackjack is more beneficial, all other conditions being equal. And such a “trifle” as 6:5 payout rate increases the house edge almost by 1.4%. In other words, in the long run, out of every hundred that you bet you lose $1.5 more on the average. If you bet $10 every time, every blackjack that you get will bring you only $12 instead of $15. As you can see, this is a significant loss. You can also come across blackjack paid as 7:5. This blackjack variation is less beneficial for the player, although not in such a great extent. 7:5 payout rate increases the house edge by 0.45%. We wouldn’t recommend you to play this blackjack variation either. Of course, casinos may assert you that the unbeneficial rule is compensated by some other extra advantages, but you shouldn’t take them at their own valuation. Find the information about how certain rules change the house edge to your favour.